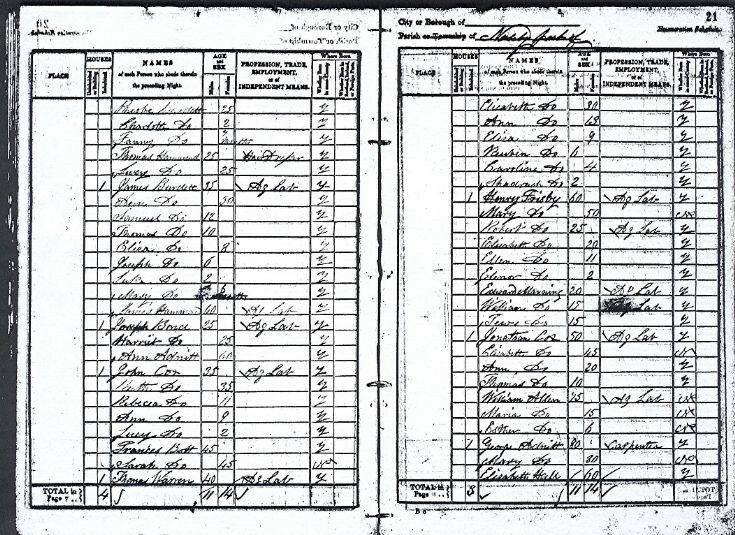 In 1841 Glenbucket consisted of 38 clachans with a population of 542 (273 males and 269 females) in 114 families. Alexander Brown	60	Farmer	y.
William Ogg	75	Ind. y.
William Johnstone	30	Ag. Lab. y.
John Semmerd(?) 13	Ag. Lab. y.
Jean Patterson	12	F.S. y.
William Kellas	50	H.L.Weaver	y.
William Reid	20	Schoolmaster	y.
Margaret Calder	25	F.S. n.
William Forbes	30	Farmer	y.
Christian Anderson	12	F.S. y.
Arthur Forbes	70	Ind. y.
William Tenement	55	Army P.	n.
Adam Reid	40	Mer. y.
Jannet MccGrigor	15	F.S. y.
William Ogg	55	Farmer	y.
Alexander Bremner	10	M.S. y.
Archibald Reid	75	Farmer	y.
Elizabeth Forbes	15	F.S. y.
Gordon Reid	31	M.S. y.
Alexander Allanach	12	M.S. y.
Jean Ogg	60	Ind. y.
William Provost	70	Pauper	y.
Sarah do	65	Pauper	y.
John Bridie	55	Farmer	y.
Jannet Brodie	85	Pauper	y.
John Farquharson	60	Farmer	y.
John Lyell	40	Ag. Lab. n.
Mary do	30	Pauper	n.
James Brodie	45	Farmer	y.
Alexander Williams	65	H.L.Weaver	y.
James Begg	60	Farmer	y.
Jean Ogg	20	F.S. y.
James Keir	15	M.S. y.
James Ingram	11	M.S. y.
Thomas Mackie	30	Officer of Excise	n.
William Dawson	50	Farmer	y.
Ann Horach	14	F.S. y.
Margaret Fraser	85	Pauper	y.
Agnes Fraser	75	Farmer	y.
John Dawson	25	Ag. Lab. y.
William Simpson	40	Blacksmith	y.
William Baunie	45	Farmer	y.
Mary Dawson	25	F.S. y.
John Farquharson	13	Ag. Lab. y.
William Forbes	7	Ag. Lab. y.
James Forbes	25	Blacksmith	y.
Alexander Riach	40	Mason	y.
John Reid	85	Farmer	y.
Ann Galishand	15	F.S. y.
Mary William	35	F.S. y.
James McPherson	35	Ag. Lab. y.
James McHardy	20	Ag. Lab. y.
John Anderson	14	Ag. Lab. y.
William Patterson	45	Farmer	y.
William do	2 months	y.
Elizabeth Grassie	12	F.S. y.
Hellen Patterson	40	Pauper	y.
Margaret Young	80	Pauper	y.
Elspet Reid	85	Pauper	y.
Ann Kellas	55	Farmer	y.
Charles Inch	30	Mason	n.
Archibald Roger	55	Tailor	y.
Isobel Stuart	60	Ind. y.
Adam Hay	95	Pauper	y.
Gordon Forbes	35	Farmer	y.
Elizabeth Brodie	45	Midwife	y.
Alexander Raeburn	60	Farmer	y.
Christian do	65	F.S. y.
Hellen Grassick	13	F.S. y.
William Chree	60	Farmer	y.
Elizabeth Grassie	25	F.S. y.
Isabel Gladl(?) 18	F.S. y.
Thomas Dow	10	Ag. Lab. y.
James Ross	60	Wright	y.
John do	20	Wright J.	y.
James do	20	Wright J.	y.
Thomas Bremner	40	Miller	y.
Alexander Dow	40	Tailor	y.